The Boston Consulting Group, more commonly known as just BCG, is one of the 3 largest and most prominent management consulting firms in the world. BCG has been consistently ranked in the top 5 of Fortune’s 100 Best Places to Work, and has been in the top 12 since they first started participating in 2006. With 87 offices in 45 countries, BCG offers you the resources typical of a global firm of their size, but their deep commitment to mentorship and social impact affords employees a superior workplace experience. Becoming a part of one of the most elite consulting firms in the world is no easy feat, but we here at TransparentCareer have done the hard work for you. Keep reading to find out more about what makes BCG one of the best, and what it’ll take to get you there. The traditional career path at BCG starts at the associate level, the most common position for undergraduates right after they graduate. As you continue to work at the firm you can move up through the positions of Consultant, Project Leader, Principal, and finally Partner. Already planning on getting an MBA after working for a few years? BCG offers full tuition reimbursement for those planning on remaining with the company after going to business school. Keep in mind, tuition for a full-time MBA will cost you at least $60k/year, not including additional fees such as housing, books, and other expenses. According to one of BCG’s regional recruiter directors, Tina Gao, BCG hires about 1,000 people a year globally. A number of these yearly hires includes those in their 10-12 week internship program. As an intern, you will be given hands-on, first-hand experience working on real cases for real clients. Don’t expect to fetch coffee. Gao says that most traditional hiring path for both internships and full-time offers for undergraduates is through their universities. BCG does target specific top schools when focusing their hiring efforts, such as UPenn, UChicago, Harvard, and Stanford, but it’s not impossible to get hired if your school is not a target. If your school doesn’t have any on-campus recruiting opportunities from BCG, you will have to work a lot harder than other students, mainly focusing on networking early with professionals in the industry in order to get noticed. Just submitting a stellar cover letter is not nearly enough to guarantee you an interview, let alone an actual offer. If you’re worried about not being a business or economics major, don’t fret. BCG does not rule out applicants based on major or concentration. In fact, BCG strongly encourages students with non-traditionally business majors, like English or History to apply for positions, as they’re always looking for thoughtful, diverse candidates, who may approach problems differently than their business-focused counterparts. According to data provided by our TransparentCareer users, an entry-level BCG associate can be making 6 figures right off the bat. The salaries only get sweeter from there, especially when you consider that the average starting salary for a graduate with a Bachelor’s degree is only $45k. When you include bonuses and other compensation, entry-level associates at BCG make approximately double the national average. The jump from Associate to Consultant typically occurs after you’ve been working at the firm for a few years and make the decision to return to school for your MBA. 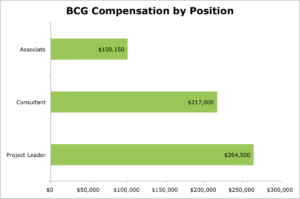 As you can see below in the compensation breakdown for a BCG associate, the starting base salary comprises a little over 70% of the entire compensation. Keep in mind, the other 30% you earn comes from a yearly bonus, signing bonus, or a relocation bonus. Signing and relocation bonuses are typically one-time fees you’ll receive when you first accept your offer, while yearly bonuses can fluctuate depending on both your own and the company’s performance. So we know that BCG has been consistently revered as one of the top places to work, but what about the culture and the benefits they offer makes BCG so unique? BCG tries to place an emphasis on the work-life balance of their employees, which is seen by their PTO program. PTO, or Predictability, Teaming, and Open Communication, is a detailed outline that group members create for every project they work on. The goal is to create transparent working norms and priorities before embarking on a project to ensure that all members are aware of their expectations throughout the project and are allotted a time-off goal. As a result of the program, BCG has reported that there was a 74% increase in employee intentions to stay at BCG for the long term, an issue that many consulting firms struggle with. Another hallmark of BCG is their Social Impact Leave of Absence. Say you’ve been working at the company but really want to take some time to make a difference in the world. BCG has got you covered. BCG allows their employees the opportunity to take anywhere from a 3 to 12 month leave of absence, penalty-free, where you can go and work at the social sector organization of your choice. BCG employees have gone on to work at the World Wildlife Foundation, Teach for All, and Save the Children among others. BCG has also been named the number 5 spot on Fortune’s 50 Best Places for Workplace Diversity. 45% of all employees, 44% of management, and 26% of executives are all women, which is fairly progressive compared to the industry overall, where only 11% of partners are women. In addition, 28% of all BCG employees are minorities. Ultimately, all firms across the industry can be working harder to improve diversity representation, but BCG manages to snag the top spot as Vault’s Best Consulting Firm for Diversity. Ultimately, finding the best company for you depends entirely on what you value in a firm. Take a look at our guides on McKinsey and Deloitte to help you find the ideal fit. Still need more help finding the company or industry that’s right for you? Fear not, sign up for free to get more industry data, as well as data relating to compensation and career navigation, all tailored specifically for you!